Has clipping coupons left your nails looking a little worse for wear? Do you need an afternoon of hand pampering but want to see the savings you’ve become accustomed to while using coupons? Look no further. Seize the Deal Lawton has a great deal for us to do just that with 57% savings on a full set of Minx Nails at Perfect 10 Salon in Lawton. This Deal has already been seized so all you have to do is go get yours. The deal is valid through Monday (9/5) but you will have until December (12/7) to redeem your voucher. Just pay $15 to get a manicure and use your savings (and super cute nails) to hit the stores with style! 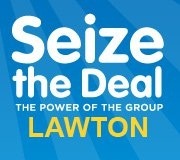 Another yummy deal is available on Seize the Deal Lawton this morning. The Wright Donuts has a 1/2 price deal on 2 Dozen Glazed Donuts for only $6.50 (normally $13). This deal will never expire but you only have until midnight tomorrow (9/1) to Seize the Deal. Limited to 1 per person. Sign Up or Log In now to Seize your 1/2 price Wright Donut deal! Yesterday was Picture Day at my son’s school so this deal has perfect timing. You get far less with a school portrait package than you do with today’s Oklahoma City Groupon offer and the best deal is that the sitting fees are waived so you can use this one package to get all of your kids pictures for the year (you could even join in and make it a great 2011 family portrait). The voucher will expire 1/26/12 but you have until midnight tomorrow (8/27) to grab your Groupon. The price of the voucher will never expire if something keeps you from using it on time. It can be used toward any portrait package after the expiration. We don’t have a JCPenney Portrait Studio in the Lawton area but if you’re planning a visit to the OKC or Wichita Falls area I would suggest making reservations and then packing a bag with all of your picture day necessities (clothes, styling products, brush, makeup, etc). This deal is just to good to pass up! Don’t miss out on this great portrait offer for 1,2, or all of your family members. This is not the main Oklahoma City Groupon offer today so be sure to check the side bar on the right to find your deal after sign up. Valid at any JCPenney Portrait Studio. Do you and the girls need a vacation? How about a romantic weekend with the spouse? Today’s Oklahoma City Groupon deal helps you do just that and for 1/2 off! This deal is only $169 for a 2 night stay at Canebrake in Wagoner, OK (only a 4 hour drive from Lawton) and this includes yoga classes to help you relax on your getaway. The voucher won’t expire until March 1st, 2012 so maybe a great Valentine’s Day is in order (if someone didn’t beat you to the reservations). There is a limited quantity on this deal so act fast as it might not last until the deal closes Monday (8/29). Gert’s Pub is back on Seize the Deal Lawton with a 1/2 price deal. They’ve had quite a few specials and events going on in the evenings lately including a recent karaoke night with the 580 Rollergirls. But, you should never drink on an empty stomach so be sure to grab this deal for $5 to get a $10 voucher to use on anything other than alcohol. Or use it for a great lunch at an even better price. The voucher can’t be used until Monday (8/29) and will expire on 11/26/11 but you only have until midnight Sunday (8/28) to Seize the Deal. We don’t get out of the house often without our kids so I can’t claim to know too much about Lawton’s night life but I have read that Ft. Sill military personnel were banned from Gert’s at one point. This ban has recently been lifted so that means everyone can enjoy the deal this time around. Saveology has a great deal for first time buyers right now. You can order a $10 CVS Gift Card for only $6. You will only have 60 days to redeem your voucher but then the Gift Card will be shipped to the address you provide on the redemption site and the card NEVER expires. $6 out-of-pocket today means $10 at CVS later! You must be a first time BUYER to get this deal on Saveology and you have until 8/31 to buy.